Eddie Cochran was only twenty one when he was killed in a car crash in England, yet his is a legend that burns as bright as only a handful of stars from the golden age of rock ‘n’ roll. His career was short, but it blazed brightly and his talents as a multi-instrumentalist, song-writer, singer and performer meant that had he lived, there can be no question that he would have gone on to achieve even greater things. Raymond Edward ‘Eddie’ Cochran was born in Minnesota in 1938, although he usually told interviewers it was Oklahoma, his family moved to California, Bell Gardens, a Los Angeles suburb, when Eddie was just a teenager. At the local Junior High school, Eddie met Connie ‘Guybo’ Smith who played bass, steel guitar and mandolin and the two of them started playing together. A couple of years later he met another musician named Chuck Foreman and the two of them experimented by recording on his new friend’s tape recorder. 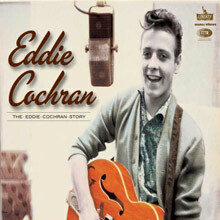 After graduating from school in 1954 Eddie met a country singer named Hank Cochran, who is no relation, but the two of them toured together and did a few recordings as the Cochran Brothers. Fifteen-year-old Eddie also recorded with a country singer named Don Deal at Gold Star studios in Los Angeles. On some of his recordings in mid 1955 with Chuck Foreman they are joined by Guybo Smith on bass and these are the earliest recordings of Eddie singing lead vocal. In a local hall in Bell Gardens, one of the Eddie’s first compositions is recorded – it’s called ‘Live Fast, Love Hard, Die Young’. Throughout the rest of the year Eddie made other recordings with a variety of singers including Jerry Capehart, a songwriter who later became Eddie’s manager. Through the early part of 1956 Eddie continued recording with Capehart on demos of his songs as well as with Hank as the Cochran Brothers. One of these gets released on Cash Records as Jerry Capehart featuring the Cochran Brothers. A couple of months later several records come out featuring just the Cochran Brothers on Ekko; they are the last records by the duo. In July 1956 Eddie’s first solo recording, ‘Skinny Jim’ with ‘Half Loved ‘ on the b-side gets a release on the Crest label, the record fails to do anything and literally a few weeks later Boris Petroff the producer of The Girl Can’t Help It, starring Jayne Mansfield, asks Eddie to record a couple of songs for the film. ‘Twenty Flight Rock’ and ‘Dark Lonely Street’ are recorded at Gold Star and in August Eddie went to Fox Studios in Hollywood to be filmed performing, ‘Twenty Flight Rock’. 'Twenty Flight Rock' was written by Eddie and Ned Fairchild and was a song for which Eddie earned not a cent because he was granted a co-writers credit, but no royalties. Ned was in fact a woman, named Nelda Fairchild who was a prolific songwriter; what we hear is her basic song with the whole feel and mood of the piece created by Eddie. With Jerry Capehart banging on a soup carton and Guybo playing bull fiddle it creates a wonderful atmosphere. It failed to chart but generated a lot of interest, particularly in Britain. It was the first song that Paul McCartney ever played for John Lennon. It failed to chart anywhere. Liberty Records signed Eddie in September and he was soon recording. Although nothing more was released until January 1957 when ‘Sittin’ in the Balcony’ came out and eventually climbed to No.18 on the Billboard charts in the spring. Liberty had Eddie back in the studio working on an album from which ‘One Kiss’ became his second single and then ‘Drive In Show’, his third; the latter made No.82 in the fall – Liberty had got it all wrong and tried to make a crooner out of the rocker on this LP. At around the same time Eddie toured Australia with Gene Vincent and Little Richard on what became known as the tour in which Richard gave up rock ‘n’ roll for religion. In March 1958 Eddie recorded his new single, ‘Summertime Blues’ on which, despite what he said, he did not play all the instruments, he just added guitar over dubs. His old friend Guybo played bass, Earl Palmer, who played on so many great rock ‘n’ roll records, was on drums and Jerry Capehart and Sharon Sheeley supplied the hand claps. Sharon had just written ‘Poor Little Fool’ for Ricky Nelson – she was just 18 years old. Eddie cut his classic single at Gold Star Studios located at Santa Monica Boulevard and Vine Street on 28 March 1958. ‘Summertime Blues’ was released in July and spent 4 months making it to No.8 on the Billboard chart and was later nominated as No.77 on Billboard’s ‘500 Greatest Songs of All Time’. It got to No.18 in Britain, his first hit, in the fall of 1958; written by Eddie and Jerry Capehart it was originally the b-side to ‘Love Again.’ The Who later covered it on their Live at Leeds album. Eddie toured hard in support of his record before going back into Gold Star to do his follow-up, ‘C’mon Everybody’, on which Eddie did overdub, guitar and drums. Inexplicably it only got to No.35 on the Billboard chart; in Britain it did considerably better reaching No.6. After appearing in an Alan freed Christmas Show Eddie was as shocked as everyone by the death of Buddy Holly, The Big Bopper and Ritchie Valens. He recorded a song called, ‘Three Stars’, two days after the crash but it did not get released at the time. Eddie’s popularity in Britain was, if anything, greater than in America and he appeared on TV, and a number of BBC radio shows with many of those who were to help create the Beat Boom listening in and seeing him live. After the last concert of their 5-week tour, Eddie, Sharon and Gene were being driven back to Heathrow Airport when their car was involved in an accident; Eddie was killed. 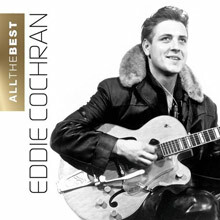 All the Best collects most of rockabilly legend Eddie Cochran's biggest hits and most notable album tracks. Included are such essential cuts as "Summertime Blues," "Twenty Flight Rock," "Cut Across Shorty," "Skinny Jim," "C'mon Everybody," and more. Purists should keep in mind that many of these are the 1999 remastered versions of the recordings and are labeled as such on the album. That said, this is one of the best two-disc anthologies for one of the most influential rock & roll musicians of all time. 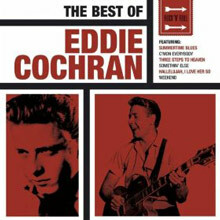 "The Very Best of Eddie Cochran" gives us a performer who is no little known, and that's a shame. Eddie Cochran was an influential 1950's rocker; he was in on the birth of rockabilly, which we might define as simply country music with a rock beat, typically sung by a country singer. Or as an up-tempo rock tune featuring guitar, and one lead singer. His career began in 1956 with "Summertime Blues," included on this record, which he co-wrote, a tale of teenage angst, desire, and anger if ever there was one. It reached number 18 on the Billboard Pop charts, and sold more than a million copies. He followed it with "Sitting in the Balcony," and "Come On, Everybody" equally adept summations of teen life. He had a characteristic sound, driving guitars, tambourine, and hand claps, and was considered a virtuoso guitarist by many. Rock journalist Bruce Eder has described him as "Rock's first high-energy guitar hero, forerunner to Pete Townshend, Jimmy Page, Duane Allman, and, at least in terms of dexterity, Jimi Hendrix." His work, then and now, has always been most popular, and most influential, in the United Kingdom. Unfortunately, while on tour in the U.K. he died in 1960, at the shockingly young age of twenty-one. He was in a taxi on the A4; the driver lost control. The driver was convicted of dangerous driving, fined £50, sent to prison for six months, and disqualified from driving for fifteen years. However, Cochran never got much past his teen years; we'll never know what he might later have done. All his hits from the 1950s are here, and they are electrifying: he was one of the great 1950's rebels. He's now little-remembered, but surely worth checking out. Eddie Cochran hasn't been unaccounted for in the reissue sweepstakes since the rockabilly revival of the late '70s/early '80s -- quite the contrary. His greatest hits have been around the block a few times, and his voluminous amount of session work has all resurfaced on myriads of foreign collector labels. This 1998 best-of on Razor & Tie duplicates 15 of the 20 tracks on EMI's Legendary Masters Series compilation from 1990. Hits are hits, after all, and Cochran's best is hardly open to debate. What distinguishes this package is the inclusion of "Tired and Sleepy" from the Cochran Brothers, an early swipe at "Long Tall Sally," the instrumental "Guybo," "Cherished Memories," and the almost pop-folk "Boll Weevil." Great liner notes from Colin Escott and top-flight sound also make this disc highly recommended. If you're looking to start your Eddie Cochran collection, this makes an excellent first purchase. 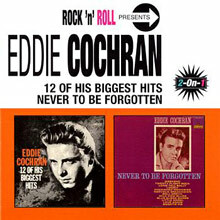 This two-fer from EMI features a pair of out of print Eddie Cochran LPs: 12 of His Biggest Hits and Never to Be Forgotten, both issued after Cochran's death in 1960. Highlights among the 24 tracks include the original hit recordings of "C'mon Everybody," "Summertime Blues," and "Sittin' in the Balcony." 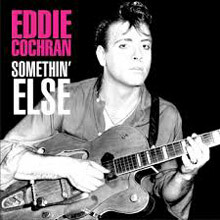 EMI did a bit of adjusting to their excellent 1971 Eddie Cochran collection for CD release in 1990, and that wasn't necessarily a bad idea -- losing a few of the lesser tracks on that slightly overstuffed two-LP set wouldn't have hurt the disc in the least. While that album's most obvious filler got the axe, so did a few obscurities that added a lot of flavor to a superb collection (especially Cochran's early country-influenced material), and adding "Drive-in Show" and "Three Steps to Heaven" hardly make up for deleting the guitar showcase "Eddie's Blues" or the Everly Brothers-style pop tune "Opportunity." And shame on whoever decided to scrap Lenny Kaye's brilliant liner notes from the LP edition. But if you want most of Eddie Cochran's best stuff on one disc, this set more than fits the bill, and the truth is if you hadn't heard the earlier version of this compilation, you'd never know what you were missing. The Legendary Masters CD is all choice cuts and no filler, and a fine introduction from one of the finest artists of the first rock & roll era -- if you don't know Cochran's music, this will get you started right, and if you know and love his work, you'll find this disc a joy from start to finish -- it's as good a cure for the "Summertime Blues" as you'll ever find. One of the earliest rock `n roll singers to write his own material, Eddie Cochran was a major influence on popular music during the late Fifties, with his innovative technique of aligning bass and guitar to a common harmonic frequency quickly plagiarized by other pop musicians. 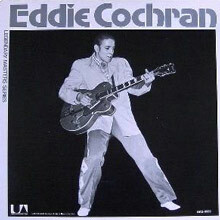 His early tragic death in 1960 ensured Eddie reached the league of cult artists and EMI's four-disc set of 134 tracks continues to acknowledge his position in pop history nearly forty years on with pristine remastering throughout the inclusion of songs recorded when he was one of The Cochran Brothers; his transition to solo performer and occasional instrumentalist; session musician, with "live" cuts, alternate takes, stereo mixes and rare recordings added to the brew. Eddie was equally adept at ballads like HAVE I TOLD YOU LATELY THAT I LOVE YOU and THINK OF ME; easy rockers in the style of THREE STEPS TO HEAVEN, PROUD OF YOU and ROCK `N ROLL BLUES, with out-and-out rock `n roll heavily laid on SOMETHIN'ELSE, TEENAGE HEAVEN and one of his enduring hits, C'MON EVERYBODY. These titles are merely pointers to the catalogue of recordings included in this excellent overview of Eddie's output which have remained fresh despite the passing years. In my opinion, Eddie's musical expertise fits somewhere between Elvis and Gene Vincent, although I am sure their individual fan bases will take issue with such an assertion. The UK's Billy Fury and Adam Faith were certainly influenced by the prolific recording output Eddie managed to achieve prior to his demise. I'm sure this recommended compilation will do much to extend the Cochran legend and prove suitably irresistible for his fans and others to enjoy.